What do you know about animals and their behaviors? Do you know if sheep are sweating, if bumble bees, how tigers fight or what family the crow belongs to? In "Did you think: yes!" you get the answer to these and a total of over 1000 questions. Play yourself or against one or two friends and test your knowledge. Do you think it's easy? No, it really is not if you are not an animal expert. The questions are clever and it is often difficult to figure out the right answers. 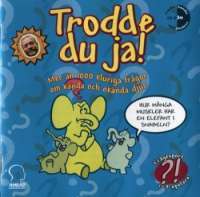 Each round of games consists of ten different questions. If you play against friends, you press your answer key as soon as you get the right answer. The one who presses first gets to answer the question. Therefore, it has to be fast, just like in quiz on TV. If you play by yourself, of course it's not as stressful. And you can think more before you answer. Because if you answer in error, you get minus points. The quiz consists mostly of straight questions, but also of video issues with Jonas Wahlström from Skansen and sound issues. "Luckhets" is another type of question where you should figure out which animals hiding behind some squares. In "Five Clues" you should guess the animal using clues, the fewer clues you need, the more points you get. In "What to remove" exists there a wolf in sheep's clothing, one of four animals should be removed. Finally, in the "Fatta galoppen", fit together an animal with the right property, the right behavior or something similar.